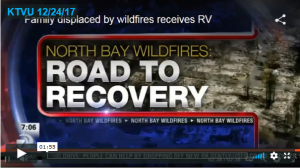 Thank you for choosing to lend your RV to a fire survivor for the winter! Your vehicle will make a huge difference to a family and the local community instead of sitting in storage gathering dust. Our insurance laws make lending RVs risky. To solve this problem, we have partnered with an international holding company that owns Mighway.com. Like AirBnB, they offer peer to peer rental, but for little houses licensed by the DMV. Working with Mighway enables us to leverage their insurance coverage system, so we can ensure that you the lender and the borrower in need are both protected from liability and damage that may occur to your vehicle. You can rent your RV for as little as a $1/day rental plus insurance. The insurance covers the vehicle AND protects its owner from liability. If you need to cover wear and tear since things break in RVs, maybe $20/day plus insurance? Why not let you decide how low you can afford to go in making this gift? Mighway is currently working to enable only qualified applicants to access these discounted RVs using their portal, but until this capability is operational for this special class of rental, please complete our form below to register your RV. Please also note, that several municipalities are asking for 1997 or newer RVs as a condition for acquiring the temporary dwelling permit. If you would like to loan your RV at less than market rate thru our collaboration with Mighway, please fill out the form below.